Chinese stars dot the front rows, a new designer from the country joins the runway calendar, and its retailers scout the city for talent: China's love affair with style is on full view at Paris Fashion Week. Outside the French capital's Rodin Museum on Friday, paparazzi clustered around after the Dior show poring over a hand-out from the company, matching names to the faces of the Chinese celebrities they had just snapped. Though totally unknown in Paris, these young women -- the actresses Huo Siyan, wearing a stand-out plumed hat, Li Xiaolu or Lin Peng -- were clearly the stars of the day, dressed to kill with a buzz of security agents around them. And their presence signals a shift in a high-end fashion industry turned increasingly towards the booming country. Home to more billionaires than anywhere except the United States, China's luxury market is forecast by McKinsey & Co to soar to 27 billion dollars by 2015 -- one fifth of the world total -- up from 10 billion dollars in 2009. "It is a country that is passionate about fashion, like all emerging nations where appearance is of the utmost importance," Didier Grumbach, head of France's fashion federation, told AFP at a "China in Paris" cocktail party last week. Held since 2010 on the sidelines of Paris Fashion Week, the event aims to build bridges between China and the world's fashion capital. 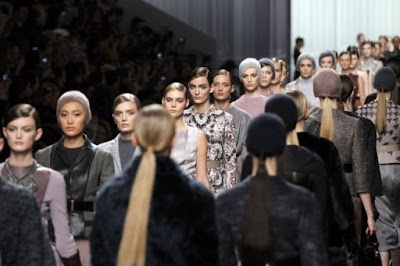 "Ten years ago we didn't have any Chinese citizens in our industry," Grumbach told the gathering, as he introduced some of the figures who are developing the fashion business inside China. One of these is William Zhao, chairman of the COPAIS industrial group, which is setting up a network of multi-brand designer stores in China. While five European brands -- Dior, Louis Vuitton, Chanel, Gucci and Armani -- currently lead in the Chinese marketplace, according to consultants Bain and Co, Zhao was on the look-out while in Paris for less-known designers. "I think it is just the beginning for the luxury industry in China," Zhao told AFP. "We are targeting the richest 10 percent of the population -- and these people want novelty." China's love affair with fashion runs both ways, with the country eager to boost its visibility in the design world. "China doesn't have the equivalent of Japan's Yohji Yamamoto or Issey Miyake," Grumbach explained. "They want to promote the work of designers who could be built up into national brands." For the past four seasons, Christine Zhao has flown in half a dozen young Chinese designers as part of the "China in Paris" initiative, to introduce them to the world's fashion capital. "Paris is a dream for designers the world over," she told AFP. "It's about opening a door for them, otherwise they don't know how to approach Paris," explained Zhao, who set up the event in partnership with the China National Garment Association and the French fashion federation. "Up to them to decide whether they want to stay -- or if it doesn't suit them, for reasons of language or culture. To stay, they need to have talent --- but also a good head for business." Many already have successful careers as industrial designers in China. "But they want to measure themselves on the international scene," said Zhao. So far three of the designers are working with Paris showrooms, said Zhao, who believes that "for social and economic reasons, people are paying a lot more attention to fashions coming out of China." The 30-year-old Chinese designer Masha Ma showed her work as part of the event two years ago, but later decided she would rather go it alone. "I want people to come to my show, and judge the clothes in a fair way, not because of a Chinese connection," she told AFP. This year Ma -- who trained at Central Saint Martin's school of fashion, and showed three seasons at London Fashion Week -- was invited to join the official Paris Fashion Week calendar, holding her first show in the city on Wednesday. Raised in a cosmopolitan family in Shanghai, Ma does not claim a specific Chinese lineage, but does feel compelled to counter her country's association with lower-grade goods, putting the focus in her own work on pristine finishes. "I'd like to contribute to changing the notion of low-grade 'Made in China'," she said. "I think it's an approachable goal."